16968-SSSD-DST is rated 4.5 out of 5 by 62. 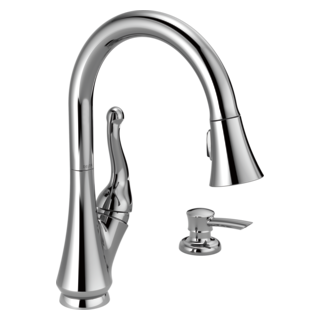 Rated 4 out of 5 by re21141 from Nice faucet This faucet fully met my expectations. It seems to be well made. The level action is smooth. Having only owned the faucet for a few months I am not able to comment on the durability. At this time the faucet works well and seems to be durable. It is nicely finished. Rated 1 out of 5 by wilson from SOAP DISPENSER IS NOT METAL The soap dispenser is a hard plastic. Very disappointed. 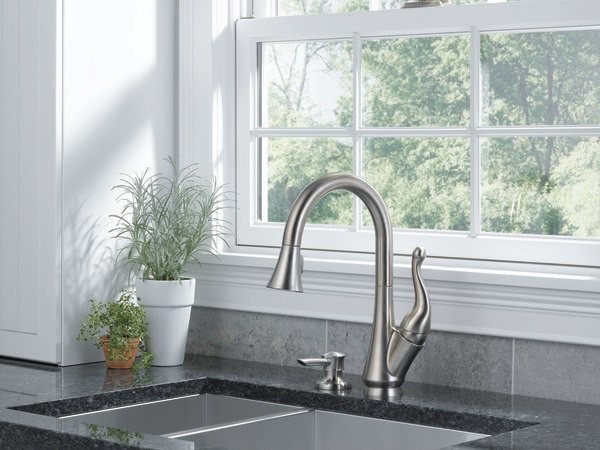 Rated 3 out of 5 by tb1210 from just not crazy about faucet first the soap dispenser is a joke, I cannot believe anyone really wants that messy thing, I did not install dispenser. the on off handle is ok but if you are not careful you do not get it completely turned off. 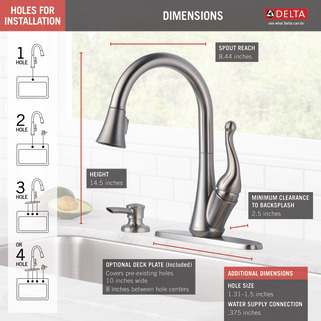 Rated 5 out of 5 by Vern from I always buy Delta products I always buy Delta products because they have always proven reliable and of excellent quality. I highly recommend them. Rated 5 out of 5 by myscrapmatt from Great features I bought this a month ago for our newly renovated kitchen. 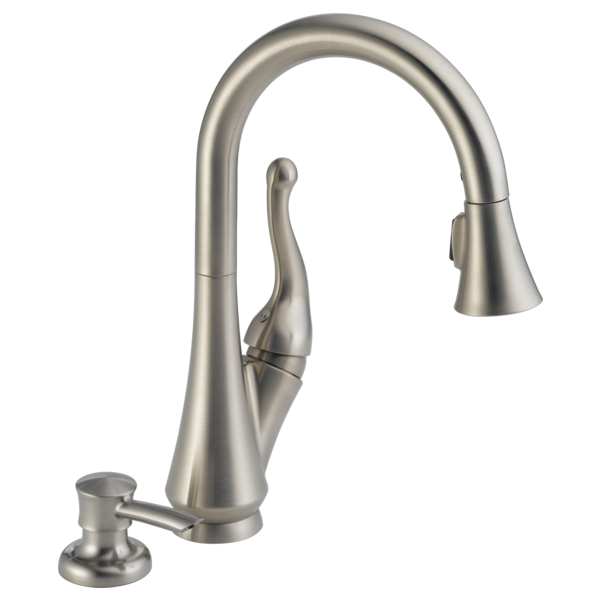 I like this faucet since the goose curve is not as tall ... it's just about 14.5 as compared with the others that I looked at which is taller. When I pull the magnetic docking spray head to spray around the sink, the spray head just goes back to its original place. Our contractor installed this as I also installed a garbage disposal under the sink. Rated 4 out of 5 by Dbfly from Nice design, easy to use. Have had to replce the valve body but had no problem getting the part from Delta at no cost. 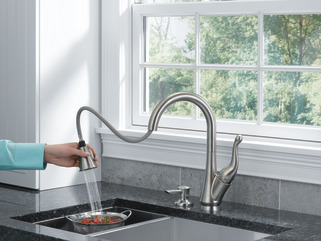 Rated 5 out of 5 by rvrv from Great faucet Solid and well designed, assembles easily, looks good and works great. Instructions for the spacer could use improvement. 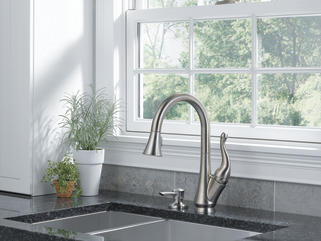 Rated 3 out of 5 by Eking from Decent faucet - don't like the base This faucet is well built and looks great. My only complaint is the baseplate that covers the 3 holes in my countertop does not feel sturdy as the plastic it snaps into isn't very robust. This should be improved. Otherwise I'm happy with it so far, and feel confident with the lifetime warrantee. The magnetic spray head works well. 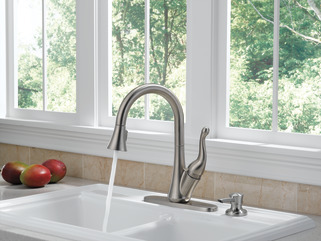 Does Delta have a water filter that attaches to this faucet. There is a magnet in the base and a weight on the hose. System works well and stays in place when properly replaced and seated. 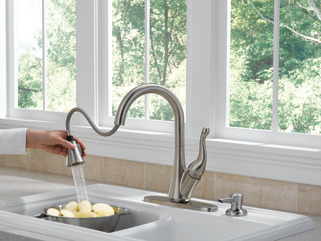 Installation on a SS Sink? How well does this faucet install on a 1 hole SS sink? Does it wobble or flex the top of the sink too much? i have had the Talbot faucet installed for couple yrs- if not closed just right the spray head leaks at the back side of head-how can i fix it? Is the soap dispenser refilled from the top or underneath? Does the sprayer have a pause feature? Wondering if this sprayer has a pause feature, ie. a button that temporarily stops the flow of water when pressed? Is it possible to separate connector in the middle of the braided pull out hose? I'm referring to the connector in Step 3b of the Install sheet. I don't remember exactly how the connection worked and I don't want to damage it. 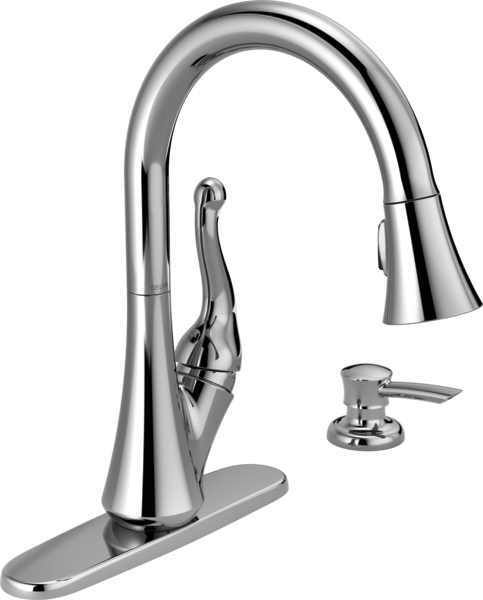 I need to tighten the nut that holds the faucet in place and you can't use a standard under-sink wrench with this model. I can't find original install tool so I'm planning to use a large deep-well socket that I hope to be able to side the hose all the way through.. so I can get it up to the nut. Also, anyone know what size that nut is? hard to measure while it's installed. The faucet continues to have less pressure while all other sinks in house remain unchanged. The faucet is about 4 months old. Is there an in line filter on the faucet that needs to be cleaned?